Earthquakes are caused by a sudden release of energy in the Earth's crust, resulting in seismic waves. Earthquakes can happen almost anywhere, at any time, and can cause personal injury and/or property damage. Although California comes to mind when we think of earthquakes, other areas including Oregon and Washington are also at risk. Locate safe spots in each room of your home — for example, under a sturdy table or against an inside wall — and hold earthquake drills with your family members. Plan your evacuation route, designate a place for all family members to meet and decide how they will communicate if separated. Keep an updated inventory of your personal property and other important documents in a fire-proof safe. Natural gas lines should have an automatic seismic safety shutoff valve at the building entry point. Use flexible connection pipes to supply gas for propane appliances and equipment lines to help prevent leaks due to broken gas or propane lines. Water heaters should be strapped to wall studs to help prevent toppling and resulting gas leaks, fire or water damage.. Secure all heavy or large objects that could fall during an earthquake. Store fragile items in closed cabinets. Ensure shelves and mirrors are securely fastened to walls. Keep heavy objects on lower shelves or on the ground. Anchor bookcases and cabinets to wall studs and use flexible straps that allow them to sway. Secure electronics with nylon straps. Get a professional assessment of your building’s structure. If you are inside when an earthquake occurs, stay there. Follow the “Drop, Cover, and Hold On” technique: drop to the ground, take cover by getting under a sturdy table or other piece of furniture, and hold on until the shaking stops. Stay away from windows and glass. If you are in bed, stay there and cover your head and neck with a pillow. Once the shaking stops, evacuate the building and be aware of hazardous conditions. If you are outside, get away from buildings, trees and power lines and drop to the ground. If you are in a vehicle, pull over to the side of the road. Do not stop on an overpass, under a bridge, under streetlights or near trees or power lines. If you become trapped under debris, do not move or kick up dust. Cover your mouth with a piece of clothing and shout only as a last resort, as it may cause you to inhale dangerous amounts of dust. Make noise, such as tapping on a pipe or hard object, so rescuers can locate you. Use a whistle if one is available. The Earthquake Is Over — Now What? Proceed with caution. Expect aftershocks, which are sometimes large enough to cause more damage. If you are inside, evacuate the building and be aware of hazardous conditions. If you live in a coastal area, be aware of the possibility of a tsunami and stay away from the beach. Walk to higher ground or inland. Listen to the radio for information about the earthquake and recovery efforts. Contact a professional to assess your home’s stability if you see cracks and damage to the roof and foundation. Be careful when opening cabinets and closets, as items may fall. Be careful around broken glass or debris. Wear sturdy shoes to help avoid cutting your feet. 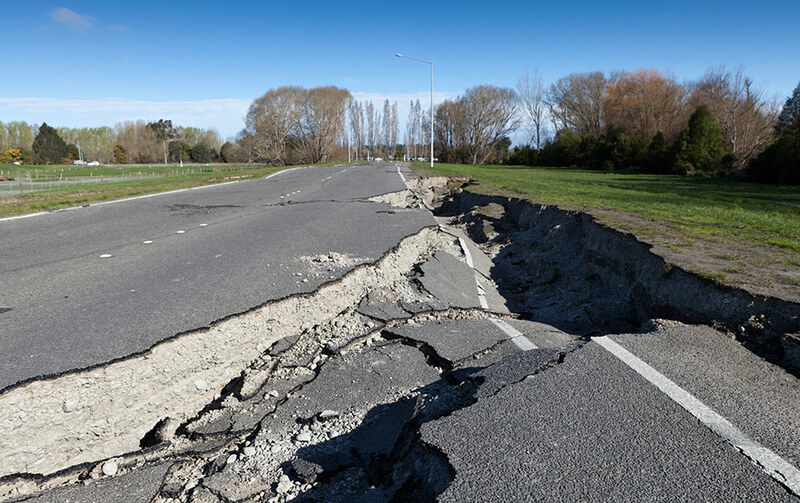 Earthquake insurance can be invaluable to protect your property investment, and needs can vary significantly – talk to us today at Fox Insurance Agency to find out how to get the best price and value on earthquake insurance for you. The information in this article was obtained from various sources and is not all inclusive regarding the subject matter. This content is offered for educational purposes only and does not represent contractual agreements, nor is it intended to replace manuals or instructions provided by the manufacturer or the advice of a qualified professional. The definitions, terms and coverage in a given policy may be different than those suggested here and such policy will be governed by the language contained therein. No warranty or appropriateness for a specific purpose is expressed or implied. Content provided by Travelers Indemnity Company.